may be predestined, but you can change that destiny. I might be wrong; it might be scheduled like some play… and you act it, not knowing that you’re part of it… Maybe…destiny is a guess: a guess of what it knows about you, and what it knows you would do. But then again I might be wrong, and destiny could be totally in control of you. Our entrée in this feast is Philosophy for kids: Sparking a love of learning, in which Dr Sara Goering (director the UW Center for Philosophy for Children) presents a compelling manifesto for doing philosophy with kids. She explains its many benefits and provides some tantalising examples of how she works in public schools, presenting philosophical thought experiments and taking children’s own philosophical questions seriously. And parents – many of us – haven’t fully thought through these questions and informed our own answers or figured out whether or not we’re justified in what we tend to think… We don’t actually address them, and the result is that children think these are questions that don’t matter. But they do matter. They matter for our understanding of ourselves and our place in the world. And now, for our substantial main course: Julia Reihs’ film Oaxaca Philosophy for Children Initiative offers a fascinating insight into Amy Reed-Sandoval’s philosophical work with young people from an ethnically-diverse and impoverished region of Mexico. Philosophical training helps young Oaxacans to develop practical reasoning skills and encourages them to participate in a very important democratic process which is helping to overcome a history of Indigenous oppression. And now when they have a problem, they don’t just deal with it superficially. Instead, they analyse it and figure out the causes and reasons behind what is happening. They explore problems more deeply and I feel that this is going to help them in their futures. Finally, for dessert we have The Foundation for Innovation in which Peter and Emma Worley of The Philosophy Foundation argue that philosophy is the only subject that specialises in reasoning – and that reasoning is even more basic than reading, writing and arithmetic. My compliments to all the chefs! And now it’s time for a nice glass of port. Featured image from the film Ball Pen, directed by Shashikanth. Cinematography by C.J. Rajkumar. 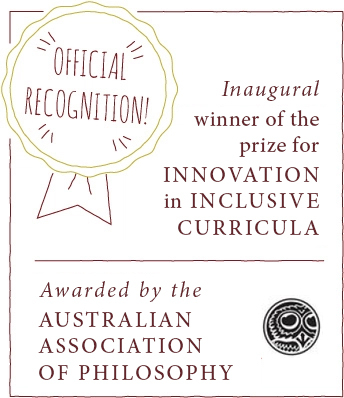 The Philosophy Club runs co-curricular and extra-curricular workshops for children in Australia. ← Are they the aliens, or are we? Reblogged this on Norah Colvin. There is so much to digest in this wonderful (full of wonder) post. Thank you for sharing. Thanks for your comment, Norah – it’s lovely to have your support. I’m so glad you enjoyed the videos. Each has been a source of inspiration for me in one way or another. If you’re in Melbourne it would be great to connect in person, so please feel free to message me if you like. Thanks for posting these videos, really beautiful engagement going on there- and wanted to add a thanks to Michelle for the Philosophy for Children workshop my daughters participated in this week: our girls have been buzzing with ideas from these sessions, and can’t wait to get back to school to try out their new ideas in class- please can we have some more workshops in Sydney? Thanks, Marco. It was lovely to meet your family – and really delightful to see your daughters taking part so enthusiastically in our recent workshops. I look forward to welcoming them back next time we run programs in Sydney!